There are plenty of examples of the Anglo-Saxons using Roman ruins as part of their defensive and domestic architecture (i.e. Alfred building burhs that incorporated some Roman walls and roads). I am wondering how (or if) the Saxons dealt with more large-scale Roman ruins, especially theatres, which are often large and obviously built for a specific purpose. I'm curious if they avoided them, demolished them, repurposed them, etc. There are several cases of Roman era ruins being repurposed by Anglo-Saxons, though I'm not certain if you'll call them "large scale". As the other answers noted, the Anglo-Saxons generally stayed away from Roman ruins and perhaps the most common way they reused these old structures were to use them for construction materials. Nonetheless, many structures were completely or partially repuposed, and perhaps the most common scenario is for religious purposes. For a complete and detailed account of Anglo-Saxon reuse of old Roman structures, see the Oxford doctoral thesis by Tyler Bell: "The Religious Reuse of Roman structures in Anglo-Saxon England." One of the best preserved examples lies in Dover, a prime point of entry into Britain both then and now. Shortly after the Roman conquest, a lighthouse was built within the grounds of what would later become the Dover Castle. When the Anglo-Saxons arrived in England, they built a church next to it, probably first in 600 AD and rebuilt four centuries later. The old Roman lighthouse was repurposed into the church's bell tower and remain standing to this day. 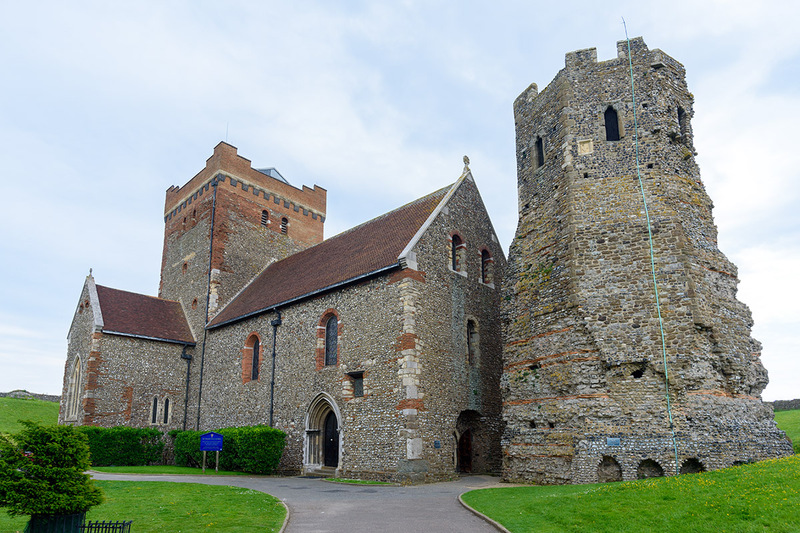 Another example is St Alban's Cathedral, located near where Saint Alban is supposedly martyred, although the current structure only dates to Norman times. In the Late Roman period a martyrium for him was built over the spot. Mathew of Paris claims in the 13th century that the Saxons destroyed the church in 586 and it was not rebuilt until 793. However Bede, writing in the 8th century, makes no such mention, attesting instead that Christian worship at his church continued to his day. This site is believed to be the only British example of a Roman place of worship continuing into the Anglo-Saxon period. Lastly and more commonly, Anglo-Saxons built around old Roman ruins. St Martin's Church in Canterbury, or rather its predecessor, offers one such example. 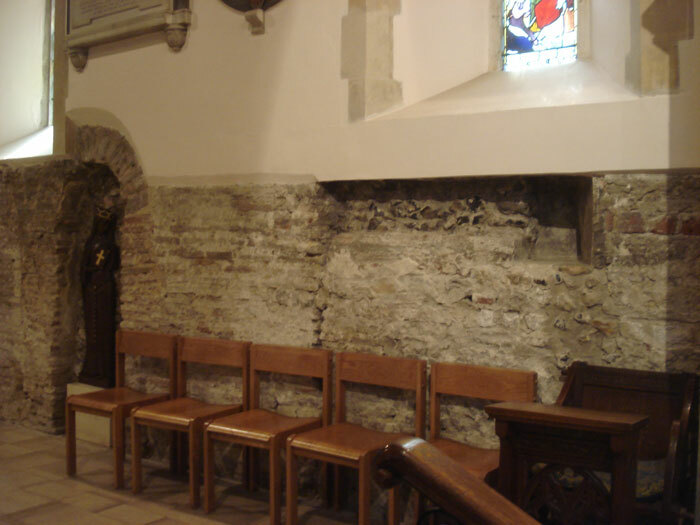 When King Æthelberht of Kent married Saint Aldeberg, a Christian princess of the Franks, she renovated the old Roman mortuary, and dedicated it to Saint Martin of Tours as the first Anglo-Saxon church in England. This was later later expanded multiple times, such that the original structure is now integrated into a newer building. Edgar the Peaceful (c. 943—8 July 975) chose to have his coronation at Bath. He was the first king to be crowned King of all the English and wanted the ceremony to be as impressive as possible (Elements of the coronation ceremony that Dunstan devised for him are still in use today). The draw to Bath was naturally the well preserved Roman ruins, including the baths. Early Anglo-Saxon buildings in Britain were generally simple, constructed mainly using timber with thatch for roofing. Generally preferring not to settle within the old Roman cities, the Anglo-Saxons built small towns near their centres of agriculture, at fords in rivers or sited to serve as ports. ...a flood of immigration of tribes who would be known as the Angles, Saxons, and to a lesser extent, Jutes. Their native building forms were wooden buildings in simple farmsteads. Fishing, hunting, and subsistence grain and vegetable farming provided for their wants. They turned their back on the Roman cities and the foreign way of life suggested and necessitated by such buildings and communities. So in general, the larger ruins were avoided, not occupied. The round-tower church and tower-nave church are distinctive Anglo-Saxon types. All surviving churches, except one timber church, are built of stone or brick, and in some cases show evidence of re-used Roman work. Not the answer you're looking for? Browse other questions tagged ancient-rome roman-empire britain early-medieval anglo-saxons or ask your own question. Did Roman military require uniform weapons? Did Roman gladiators use axes? Did Roman statutory law in the 1st century allow for crucifixion of non slaves?